Bursting complacency: Ireland would benefit from re-adopting Sterling in the event of a Brexit, according to Toscafund’s chief economist Savvas Savouri. Toscafund, the huge hedge fund founded by high-profile London-based investor Martin Hughes, is predicting Ireland could be forced to quit the EU in the event of British exit (Brexit), particularly if Brussels imposes any trade restrictions on the UK to deter others from following its lead. 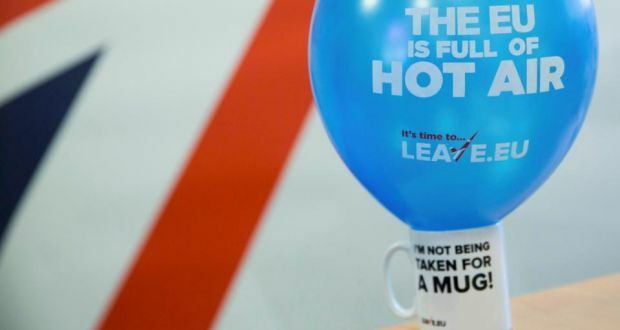 Toscafund, one of the biggest hedge funds in London with almost £3 billion of assets under management, released a paper in recent days saying the UK has “nothing to fear” from a Brexit after its referendum on the issue this year. However today EU business leaders have called on the rest of the EU to support Britain’s case for measures to improve competitiveness and said they strongly supported the UK’s membership. Ibec’s chief executive Danny McCoy said in a statement issued with other EU business leaders that it was “vital” that the EU takes steps to improve competitiveness. “The UK and Irish economies have incredibly strong bonds, but for firms to make the most of this it’s vital that the UK stays in a reformed EU,” he said. The conditions which Europe would impose on the UK if it left remain uncertain. Toscafund’s chief economist, Savvas Savouri, said Brussels might be slow to impose trade restrictions on the UK because of the disastrous impact it would have on some members, principally Ireland. In the paper, Britain stands up – Better to exit European Union, Mr Savouri says the extent of Irish-UK trade links means Ireland would have to stay close to the UK following a Brexit. Irish and British trade is worth more than €1 billion each week. Speaking yesterday to The Irish Times, Mr Savouri insisted Ireland would benefit from re-adopting Sterling in the event of a Brexit. Deflation in the euro zone meant proper recovery on the continent will take years. The economic relationship between Ireland and the UK is “symbiotic”, he argued, and this country should seek an exit from the EU in the event of any attempt to change European rules on UK trade. Toscafund has previously made controversial predictions in relation to Ireland. In 2012, it said Ireland’s export model is “feeble”,Toscafund’s founder, Mr Hughes, infamously attained his “Rottweiler” nickname due to the aggressive nature of some of his investment strategies. His fund holds stakes in several companies, including the Irish-run exploration company San Leon.